So off we went to the West MacDonnell ranges and into Palm Canyon in the Finke Gorge National Park (just past Hermannsburg). We were here once before and had a lovely time. The general area is fairly arid (as you see in the distance) but there are some very special palms which survive in very well watered canyons. They are left from long ago when the climate of Australia was wetter. And Palmier. These palms are called Red Cabbage Palms because when they are young they have a distinctly red look to the leaves. There are similar species at some of the other places we have visited over the years like Lawn Hill, Mataranka, and Canarvon Gorge. These areas always provide a cool retreat in the heat of the day. And to think we were worrying about freezing overnight not long ago. 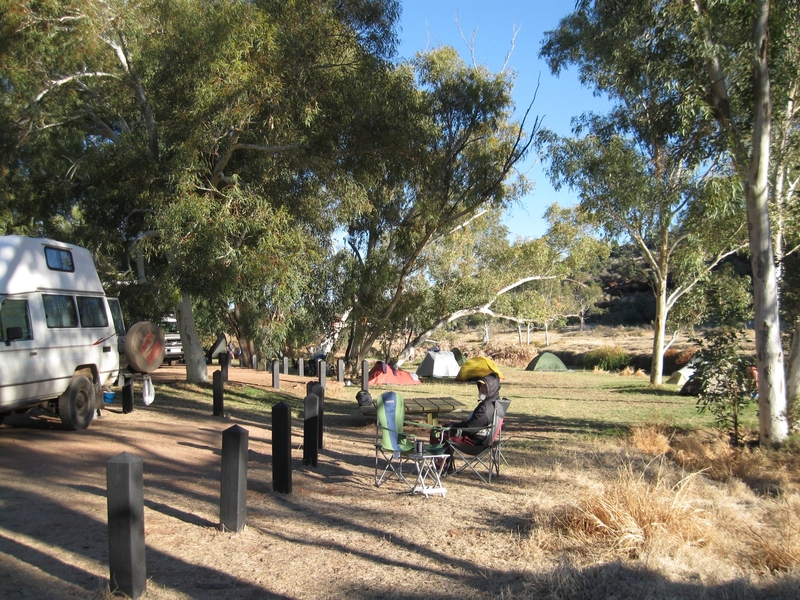 After you get in via the 4WD track (a real 4WD trick not just a dirt road) the campsite is a lovely well watered flat area on the edge of a tributary to the Finke River. We selected a nice spot, and were well in place when the large flat area began to fill up with a beautiful sea of individual tents. These were walkers who had been doing a very long trek and finished a couple of days early, so they decided to get their transport to bring them over to Finke before heading back Gold Coast. I'm the one in the foreground wearing the hat under the hood...to keep warm. Cold nights and it is still cold first thing in the morning. But not freezing, and the days are gorgeous once the sun warms things up. 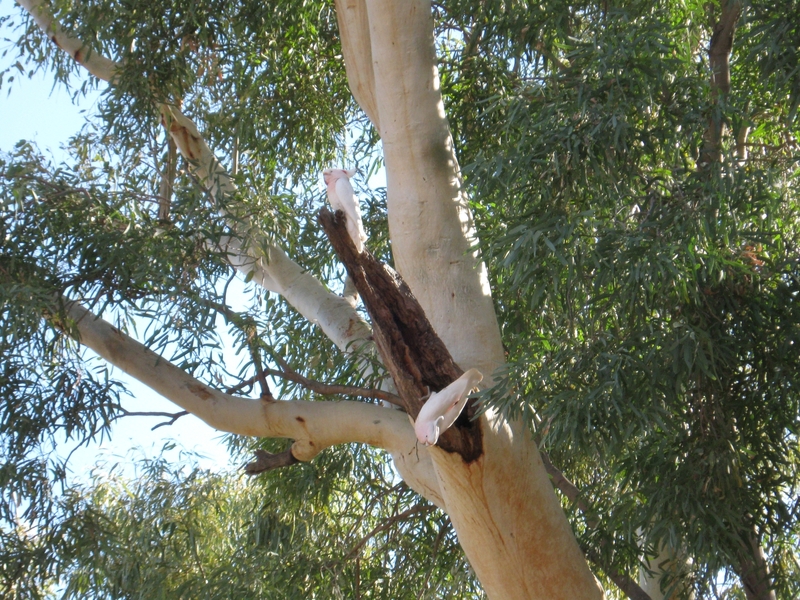 One of the delights of this camping area was that a pair of Major Mitchell's Pink Cockatoos were considering moving into a tree a short distance from us. The male stood guard while the female checked out the apartment. At least we think that was the division of labor. There was also an altercation between the Pink Cockatoos and a pair of Australian Ringneck Parrots who also thought that was a pretty good apartment. This was the best look at Pink Cockatoos we have had. We caught a glimpse of them earlier on this trip, but this was a great sighting. We were hoping to take a better photo the next day...but they didn't come back. Must have found another likely place to nest. We left Finke after a few days and headed back into Alice not sure how long we might be there. We certainly planned to stop for provisions. But as we got closer we saw that the whole place was enveloped in smoke. Bush fire! Acutally, two bush fires which were North of town. So plans changed quickly and we just kept the vents on and kept going. We listened to the report on the radio and it sounded like they might be arson...but we were out of range before that theory progressed. Since then we've heard a report of more fires near Alice what must have been a few weeks later. 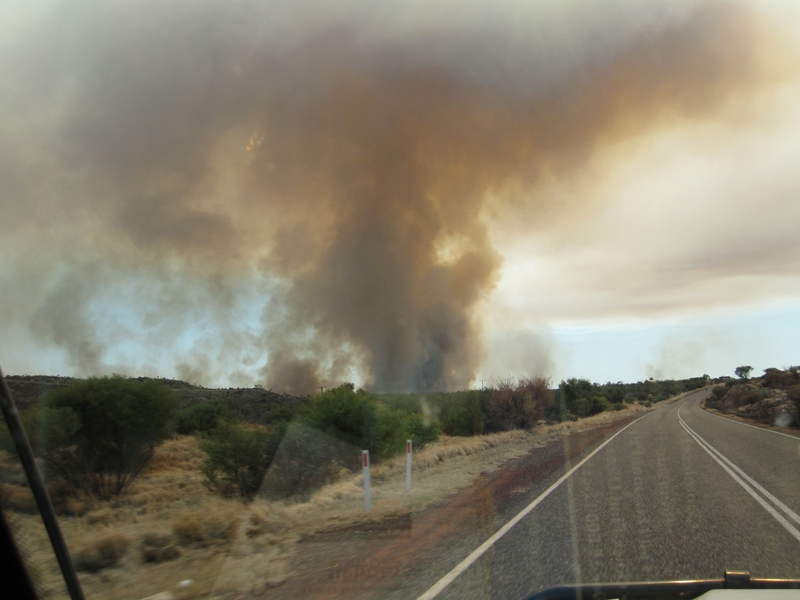 Jan snapped this pic through our windscreen as we passed the larger fire which was a little way up the Tanami track. We had been considering taking the Tanami track but it was no longer on the cards. So we shot up the Stuart Highway and camped at Devil's Marbles (shown at the top here) before heading on further to Mataranka and Bitter Springs. The complete contrast to being chased away by fire and frozen nights. The weather was warmer, and we spent our time bird watching around Bitter Springs and floating in the springs to cool off in the heat of the day. Actually you can float in any temperature because the artesian water here is about 22 C (72 F) all the time. This is an Azure Kingfisher which we saw every day hanging around the springs and occasionally striking the water at speed to grab a little fish (startling people floating quietly down the stream at the same time). This is the stretch of the springs you float down. The water is crystal clear. It got the name "Bitter Springs" because the content was too high in minerals for watering the stock or the horses. We never tried drinking it. Floating in it is just fine. Since we visited it a few times most days we got to see the birds and animals which live there (despite the tourists) and they have their own routines which sometimes crossed paths with ours. The camping area we were at is within easy walking distance of the springs so we enjoyed no driving for a few days...until our refrigerator battery ran out. That calls for moving on from paradise to charge it up again. Our camper has two separate batteries: one to start it and one to run the "household" items - of which the refrigeration is the big power user when you are in hot areas. So we headed North to another of our favorite spots. We passed through the town of Katherine and on to Edith Falls. Edith Falls is actually the far end of Kathrine Gorge (Nitmuluk) National Park. We've been here quite a few times so I was sure I'd have a picture of the falls and the plunge pool at the bottom where you go swimming. And when I went to put this together I discovered that those pictures aren't on this computer. They are at home in Auckland on a different computer or just backed up on CDs. Oops. So instead you get a photo we took while we were there on a hike up above the falls which takes you through drier country and meets up again with various water holes. 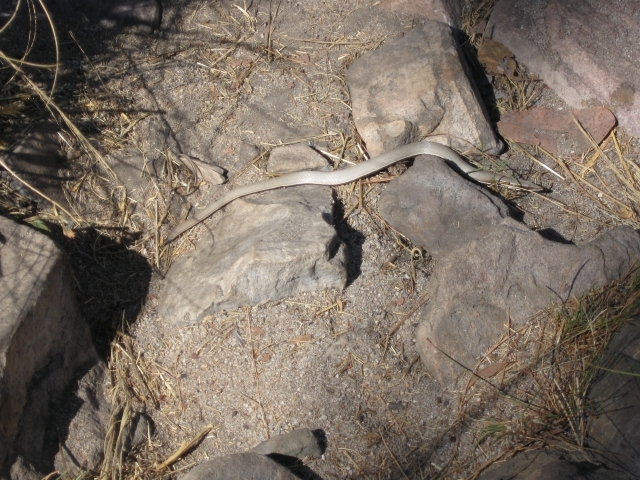 This a snake or a legless lizard. Trust Australia to have a lizard without any visible external legs which "pretends" to be a snake! We don't investigate snakes closely enough to find out what species they are, and we didn't examine this guy close enough either. But I think that the give away is that snakes don't have ears but legless lizards do. And it looks like this one does. Edith Falls is as far North as we go on this trip, so from here on we turn around had head South. Once again we are prompted by our refrigerator battery. The next stop isn't far away, just back to Katherine for provisions and then out to Katherine Gorge. We arrive at Katheine Gorge and get a powered site because we are worried about the refrigerator battery not having been charged enough. That means rather than being spread out in a big field we are right up against our neighbors. 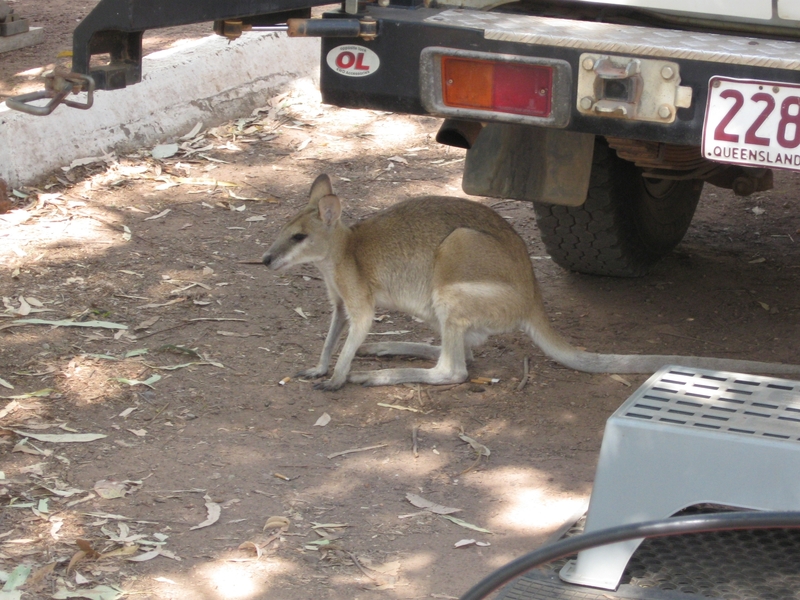 But this site does come with its own resident Agile Wallaby. Very cute and very clever at hanging around and getting any food you leave for a minute. 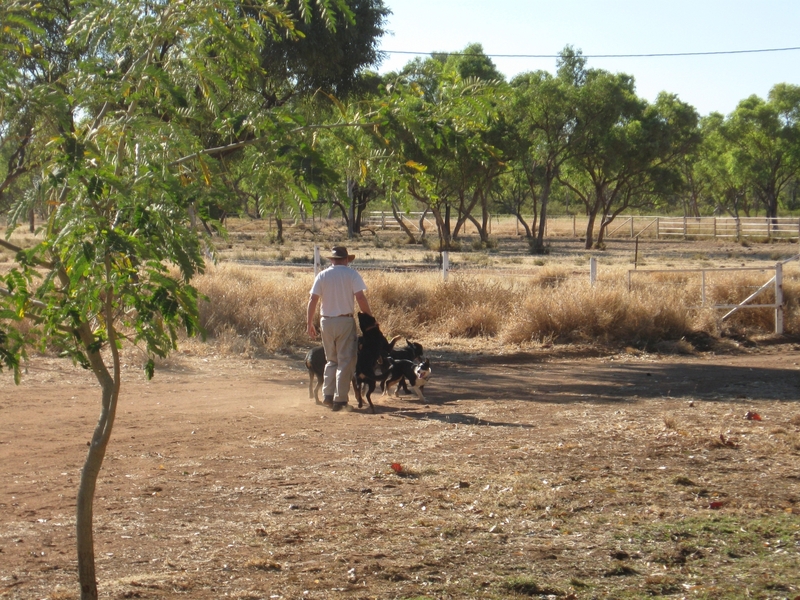 We're here for a couple of days because we've got Trev our vehicle booked in for a service in Katherine. 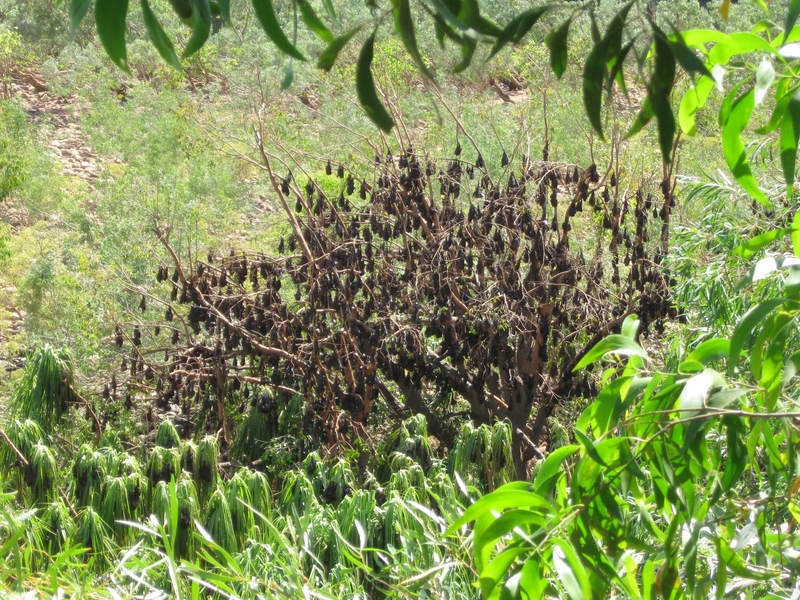 One of the ongoing environmental battles in Australia at the moment is Fruit Bats (a.k.a. Flying Foxes). And they seem to have grown in numbers since the last time we were here. It looks like they get so numerous they destroy tree after tree. Plus they urinate and send up a merry stink where they roost. So locals often want them out because they ruin the tourist trade, while the government and park rangers say that population booms are natural and the bats are essential pollinators of many plant species. But there are more issues at the moment because horses and people are getting an incurable nasty called Hendra Virus and there are more cases in Queensland this year than ever before. Hendra virus isn't in all species of Flying Foxes, and it isn't in the Northen Territory ones at all. Research is ongoing to find out what is going on, and why cases are on the rise. The issues seem to reflect so many of the complex environmental issues in Australia. One thing which does help is to get a larger perspective, so we headed up the escarpment on a walk and had a look at the Gorge from up the top. 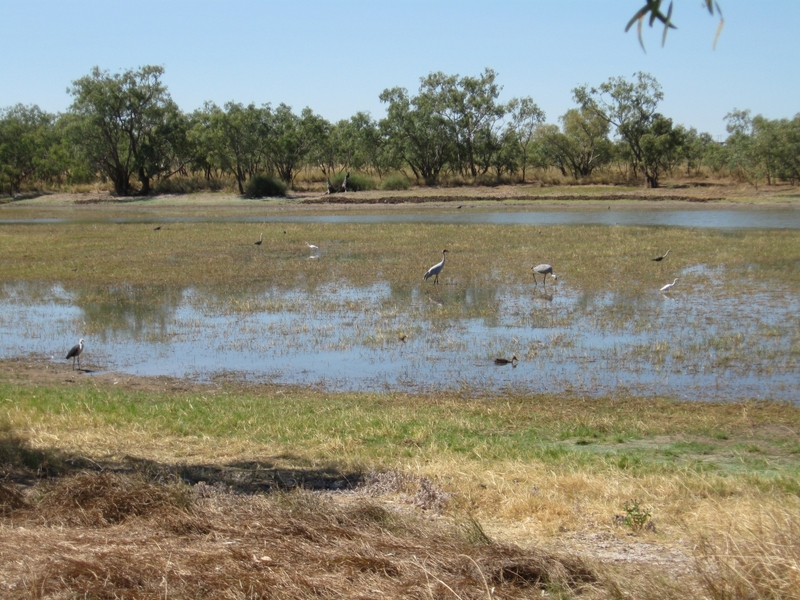 So here we see the arid area and the well watered area along the Katherine River. If you look closely (remember you can enlarge it by clicking) you can just make out the trees along the edge of the river which have been colonized by Fruit Bats and lost their leaves. You can also see how the National Park has been impacted by having bus parking and a visitor centre. But really, the area affected by these things is small compared to the general landscape. So we just have to hope that all the things we see as big environmental changes up close look smaller when set against the whole landscape. Mind you, cane toads once looked like a good bet to introduce for insect control...and rabbits were introduced. This pic also shows a Kapok Tree with its yellow flowers. They are all around in the Northern parts of Australia, and in Spring they flower before getting any leaves. I can see them around me from where I'm typing this. From Katherine Gorge we headed into town and got our vehicle serviced (we stick religiously to the recommended schedule because we don't want any suprises when we are in remote areas). And we spent some of the waiting time resting in the shade at another warm artesian spring. All good. Then we continued South and turned East towards Cape Crawford and eventually Queensland. The Heartbreak Hotel in Cape Crawford has good food and camping, and leaky taps. 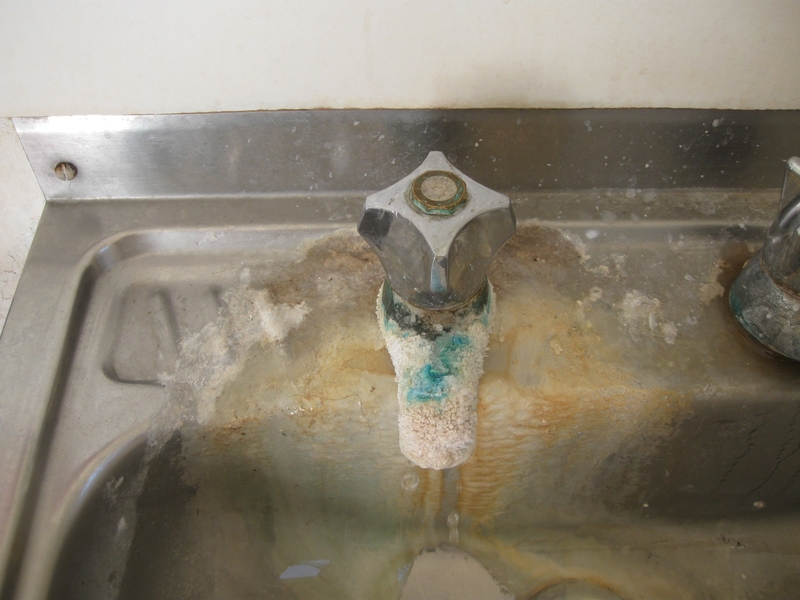 Now along with other environmental problems faced in Australia water always looms large. Usually there isn't enough. Occasionally there is way too much! So it always seemed strange to me that in our travels we visit so many places which have taps which leak in the Outback. This one at the Heartbreak helps show why. Bore water. Somebody once said to me that if they changed washers often enough to avoid any leaks they would be changing them once a week. This is the most extreme example I've ever seen of a tap left to its own fate. Locals can drink the bore water but we're not great fans. We continued South from Cape Crawford and popped out on the Barkley Highway at Barkley Homestead where we stayed another night. 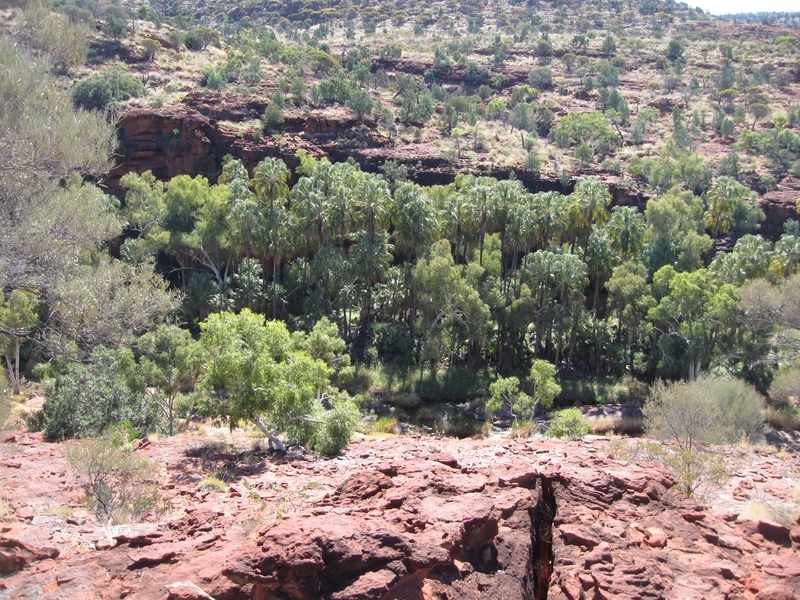 Then on East towards the Queensland border. 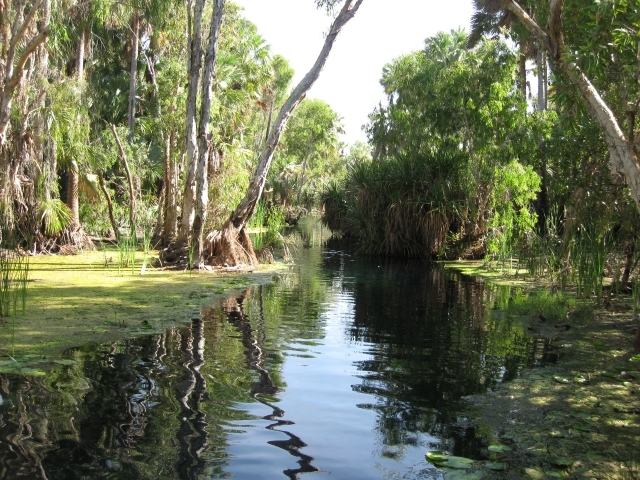 Not far from Camooweal (the Queensland border town) we camped at a beautiful lagoon on the Georgina River. We've been here a few times and it is always full of birds. 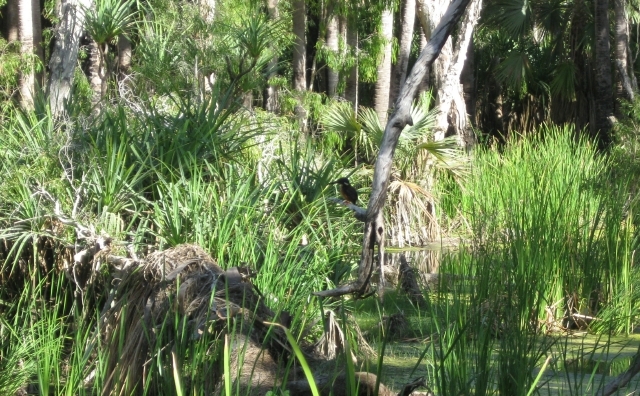 There are brolgas grazing and all sorts of other herons and egrets busy grabbing and swallowing fish. We were a bit shocked at how the lagoon is also attracting a huge number of free campers. Each time we've been there it gets busier, and the free campers (and some large vehicles) seem to us to begin to have the same impact on the lagoon edge as those Flying Foxes do on trees. Plus they bring their dogs, and we even saw people travelling with a cat! It was tethered, which was fortunate as there were all sorts of quail in the grass nearby which would have made a tasty treat. We had heard further South that things were particularly busy this year with more people than ever going for free camping rather than campgrounds where you pay. This is consistent with retired people who saw a fair chunk their income disappear in a puff of Lehman Bros smoke. 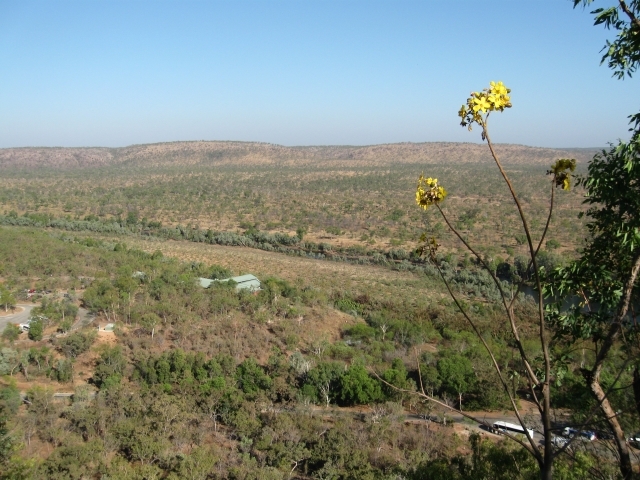 After passing through Mt Isa and Cloncurry, we headed North to Mt Roseby where we visited Cathie and Harold McMillan. Cathie and Jan were together at Teacher Training College and have kept in touch. We've visited a few times before and looked forward to another stay. 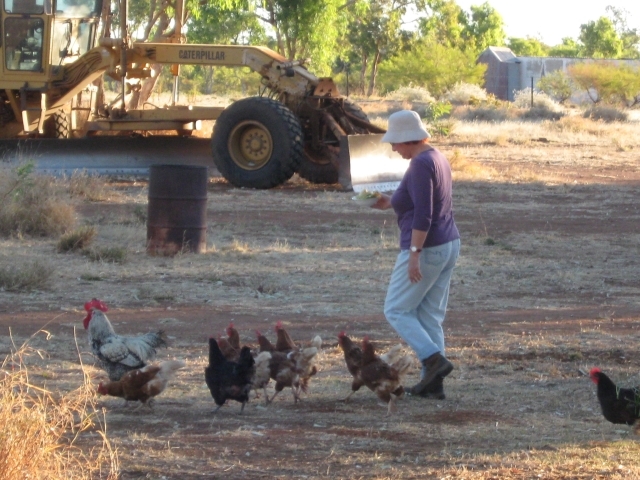 This time we were also trusted with special responsibilites: we looked after 13 chickens, 5 dogs, and watering the homestead while they went into Townsville for a few days. Here's Jan and her chickens. She is now thinking how nice it might be to have some at home. We were getting seven eggs a day. The big grader in the yard is what Harold uses to maintain the many roads on the property. Steve's jobs included taking the 5 dogs out of the kennels and giving them an outing each day, then feeding them before they were put away for the night. What we didn't know is that the dogs are sometimes a bit naughty and go running off to tend to their own business and they don't all come back at once. That created problems because the chickens can't be out if the dogs are out. 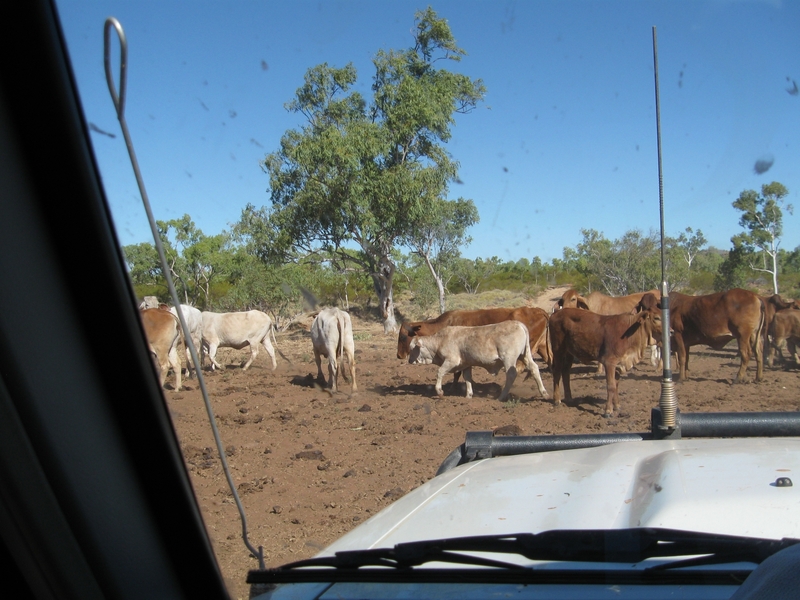 It reminds me of the old puzzle about crossing the river with a fox, a chicken, and some grain when you can only take two at once... We later discovered that the secret was to honk the horn on the ute (short for a "utility", or pickup truck ) to let them know when to come back. Fortunately while we were playing at being farmers, we didn't have to look after the real business of the farm: cattle. But we got treated to a bit of cattle action when the real farmers were back. Jan went on a trip with Harold to check the water troughs and bores out in one of the more remote areas and got to see plenty of cows up close, as well as lots of great scenery and birds. And we both got to go and watch mustering by helicopter and motorbikes. It is always eye opening stuff for us city folks. At least we know when to keep quiet and out of the way. One task which was within our area of competence was preparing a list of the 54 species of birds we saw around the homestead. One of the exciting things for us is several sightings of Red Chats which we have never seen before (birders call that a "Lifer"). And Jan saw some Banded Lapwings ("Lifer") on the bore trip. They may even be in this photo if you look hard enough at the full sized version. I haven't spotted any birds in this photo yet (only cattle), but she has others which prove it. We are back in Horseshoe Bay, Bowen and that's where I'm preparing this text. We've been to the pie shop and swum in the sea and had our walks and been here a week now. Same drill as last year. Very relaxing. The only fly in the ointment is that the wind has come up and we're coming to know why the nickname is "blowen". We may head inland tomorrow depending on the weather forecasts. Acknowledgments: Thanks to Cathie and Harold McMillan for making us so welome at Mt Roseby. And supplying us with a great Cos lettuce which has lasted us until now. And the dozen farm fresh eggs. And the ripe avocados. And the home baked fruitcake. Nothing like living off the land!